Synflex Review: Does This Dietary Supplement Really Treat Arthritis Issues In Pets? Synflex review, it is a liquid glucosamine dietary supplement that promises to bring mobility back to your pets suffering arthritis and other related joint problems. According to the manufacturer, Synflexis manufactured using pharmaceutical grade liquid glucosamine sulphate and glucosamine HCL. To enhance effectiveness, the manufacturer also fortifies the supplement with ten other beneficial ingredients. how does SYNFLEX work ? Unlike many glucosamine supplements that come in pill form, Synflex comes in an easy to take and fast absorbing liquid form. Experiments conducted on glucosamine proves that liquid glucosamine is easily absorbed. According to synflex review, This product is available for both humans and pets (including horses). The manufacturer claims that they produce it using pharmaceutical grade standards making it safe for both humans and pets. The product comes in a 236.5ml translucent bottle with a blue label. The bottle comes with an inbuilt dosage scoop cup which is graduated for easier dosage. The product is available in leading retail outlets and online shops for roughly $30. Note that this price may vary depending on the shop you purchase it from. If you buy it online, confirm the shipping and handling costs before purchasing. Glucosamine – this is perhaps regarded as the king of joint care. It is known to fight cartilage degeneration and promote cartilage formation. It has been used in both human and animal joint supplements. Chondroitin Sulphate – chondroitin is a highly hygroscopic ingredient that is known to promote joint lubrication and production of synovial fluids. The product is used side to side with Glucosamine in most products. Bromelain – found in small quantities in the body. It is popular in the joint care arena due to its natural anti-inflammation properties. Omega 3 Fatty Acids – omega 3 fatty acids inhibits enzyme interaction and at the same time help improve the health and appearance of skin, nails and immune system. The product comes with a measuring reservoir and thus it will be easy for you to measure the dosage. Based on Synflex review, it is manufactured form all natural ingredients and therefore it is not known to cause any harmful effect. Nevertheless, some customers have reported their pets experiencing mild side effects especially during the first ten days of usage. After consulting a qualified vet, the mild effects were attribute to either allergic reactions or flushing out of toxins. If your dog is pregnant or breastfeeding, you need to be careful when administering this product. Consult your vet prior to giving this product. Synflex may also have undesirable effects on dogs that are known to have anaemia and other blood related complications. In case the pain and symptoms persists (for more than 8 weeks) stop administering Synflex and seek veterinary advice. The problem may be deeper than you initially thought. 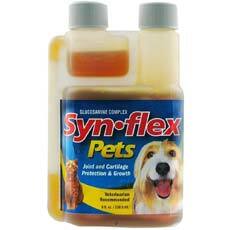 Synflex is a darling to many pet owners due to its friendly budget and the ease of administering. We love the idea of having the product in liquid form since it can be given even to the smallest Chihuahua dogs. The price is also pocket friendly and the efficiency of the product is straight up. We highly recommend this product for people seeking to have an easy to administer joint supplement.